As we drift into shorter days and cooler nights, it seems like the right time to adjust our pastry dreams accordingly. 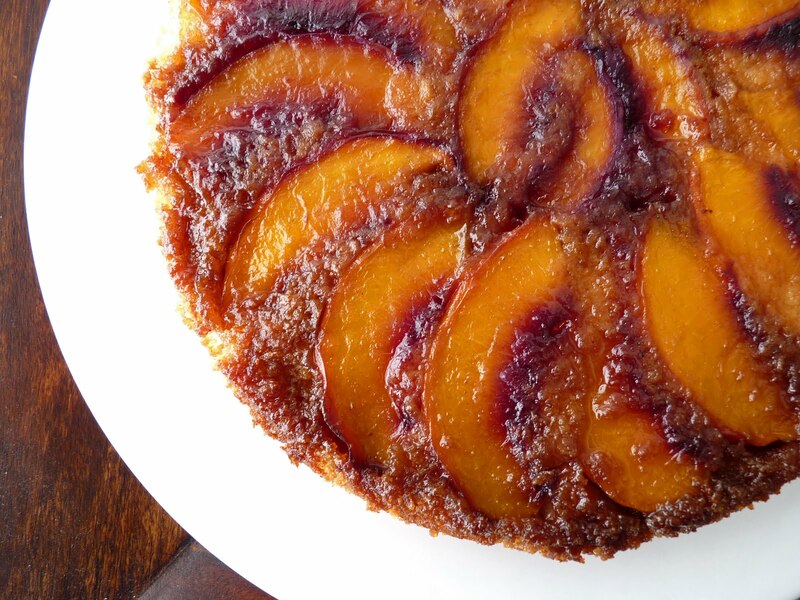 After a great season of stone fruit, we are about to leave all that deliciousness behind. 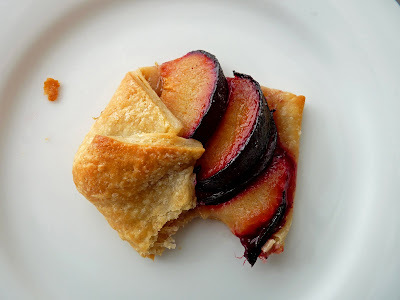 I’m still seeing lots of late summer nectarines, plums, berries and a few figs at market but it’s definitely the end of the season for most everything else. So thoughts seem to turn to the comfort of custards and creams as we sense the winds ahead. 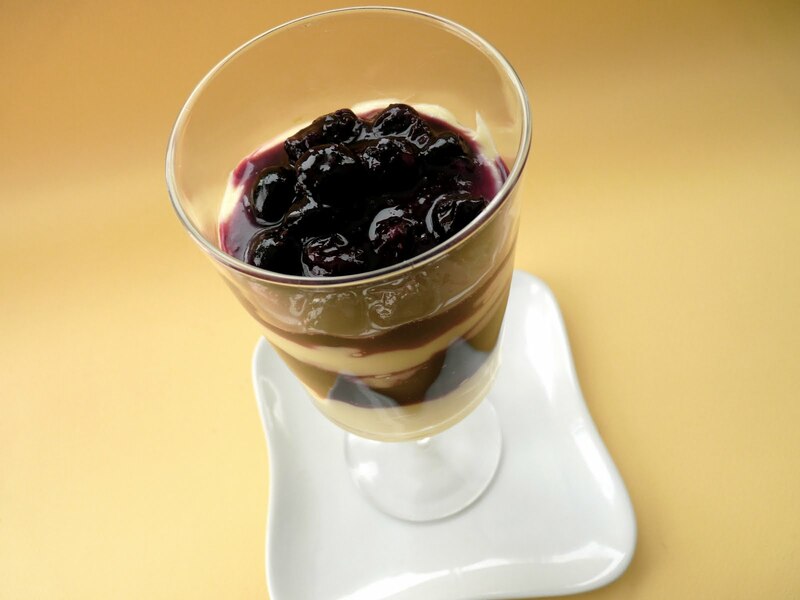 This dessert is a light, creamy and fruity transition into autumn. The vibrance of fresh ginger delivers a bright pop of flavor to luscious dollops of cream. The blueberries add just enough tartness to make this dessert slightly irresistible. Sometimes the transition into a new season can throw us off for a brief time. The shifting of time and light, fruits and vegetables, sights and sounds can be an occasion for pause. But it's also a moment of familiar anticipation of the coming tastes and aromas of a new day. Cheers to an autumn full of inspiration at your table. - If your blueberries are super tart, you may need more sugar. If they’re not, you may need a spritz of fresh lemon juice. - Either component can be made and stored in the refrigerator a day ahead. Just stir the cream to return it to its creamy state and serve. - The Ginger Cream would also be great with roasted pineapple or banana, fresh mango, peaches, figs or pears. Or a simple side of chocolate cookies. Peel and cut the ginger into thin slices. Pour the milk into a saucepan, add the ginger slices and 1/4 C sugar and bring to a low simmer, stirring to combine. Remove from heat, cover and steep for about a half hour, tasting for strength. Strain the milk to remove the ginger slices and reheat to a low simmer. Whisk together the yolks with the remaining 1/4 C sugar. Add the cornstarch and whisk thoroughly until the mixture is light yellow. Slowly add the hot milk, whisking constantly to temper the eggs. Return to the heat and bring to a very slow boil, stirring slowly and constantly. Cook for about 2 minutes. Take off the heat and add the butter pieces, stirring until the cream smoothes out. Add a slight pinch of salt, to taste. Pour into a clean container and press a piece of plastic wrap into the surface. Set aside to cool. Combine the fresh blueberries, water and sugar in a saucepan. Cook over low heat for just a few minutes until the fruit gets saucy. Set aside to cool. 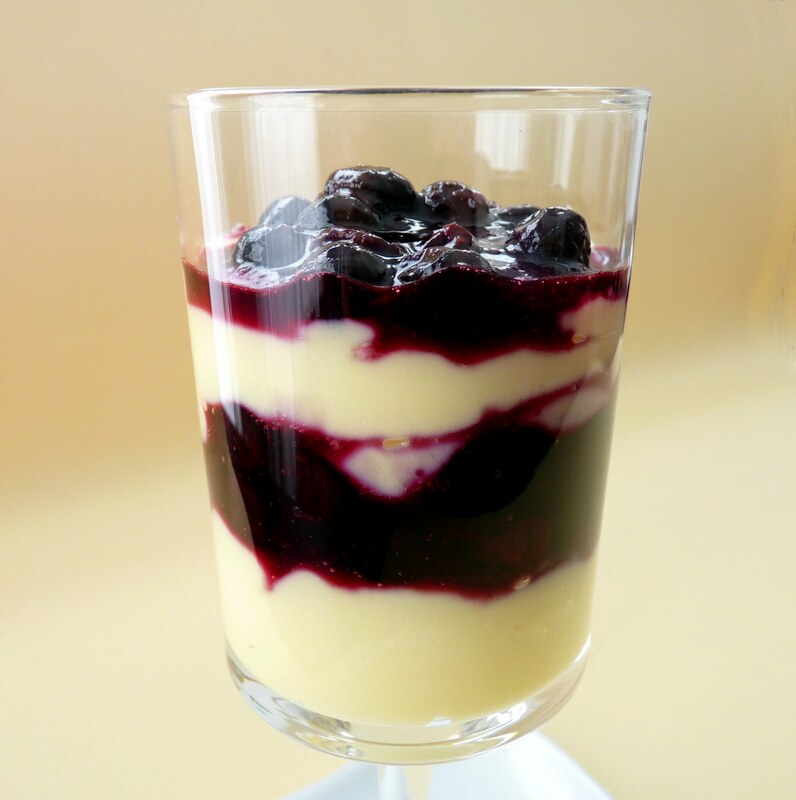 Layer the cream with the blueberries in a parfait glass or scoop into a bowl. As we head into the official end of summer, my impulse is to make turnovers. These are the kind of pastries that really celebrate the sheer goodness of fresh fruit without a lot of complicated ingredients. Soon we will turn to apples, pears, quince, chocolate, nuts, spice and all the other great elements of fall. But for now, I think these turnovers, which look like dainty little handkerchiefs to me, will ring in the new season very well. As much as I love putting together complex flavors and compositions, some of my favorite items in the Kingdom of Outrageously Stupendous Pastry are based on fairly basic but elegant components and methods. These are a concoction of plump juicy plums tucked into a deliciously crisp and crunchy pastry. The dough mixes quickly in a food processor and is pretty easy to handle. I’ve added only a whisper of cardamom to the sugar that sweetens the package. But other than that, they are a supremely simple and rustic celebration of the end of summer 2010. Cheers, fellow bakers! - Because there is a lot of folded-over dough in this particular formation, be sure to roll the dough out to about an 1/8” thickness so all the layers bake through. - If you're not super comfortable working with pastry dough, form 3 dough packages instead of two so you're dealing with a smaller piece. Roll each package out to a 16" x 8" square and then cut into 8 4" squares. - Always taste fresh fruit to gauge the level of sugar you’ll need. When it was picked and how ripe it is affects the sugar level. 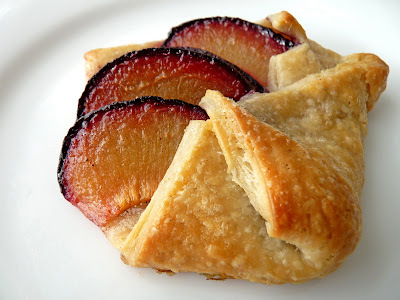 Plums tend to be quite tart and baking them emphasizes their tartness, so in this instance, be generous with the sugar. - I’ve added cardamom to the sugar because its fragrance and flavor make it one of the most intoxicating spices imaginable. Use your own favorite or keep the sugar plain. - These pastries are best eaten the same day. For the pastry, combine the flour, sugar and salt in the bowl of a food processor. Add the chopped butter and process until the butter is reduced to smallish pieces and the mixture resembles coarse meal for the most part. Add the sour cream and yolk and pulse just until the dough starts to come together. Be careful not to overmix. Gather the dough and portion it into 2 discs. Wrap each tightly in a piece of plastic wrap. Chill thoroughly. Place one of the packages of chilled dough on a lightly floured piece of parchment and let it warm up a bit. Dusting lightly with flour as you go along, roll out a rectangle measuring about 12” x 16”. Trim the edges to make a clean rectangle and cut the dough into 12 4” x 4” pieces. Chill while you repeat the process on the second package of dough. If the dough feels too soft, chill the dough squares until you can handle them easily. 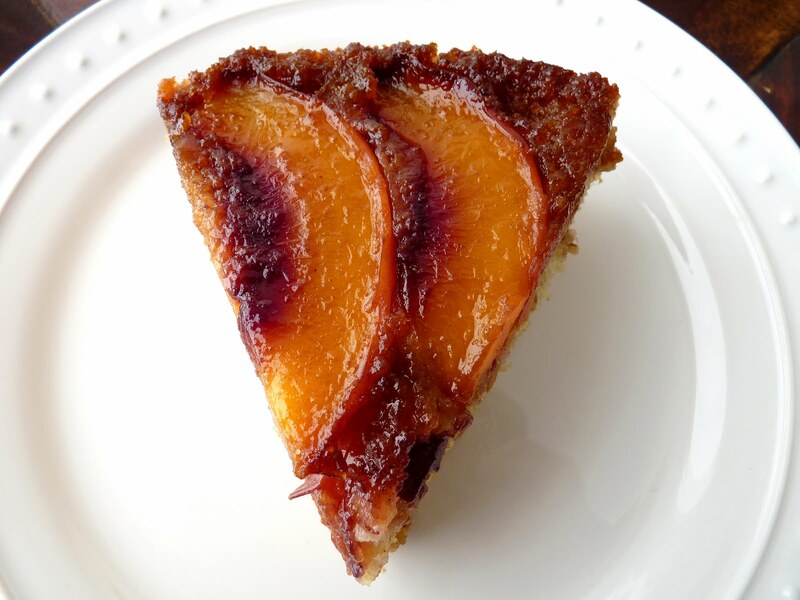 Cut the plums into thin slices. Whisk together the sugar with the cardamom or other spice, if using. Combine the egg and water to make an egg wash. Remove half of the dough squares. To form the pastry, place a square of dough on a work surface with the corners in the shape of a diamond. Top with 3 – 4 slices of fruit on the upper half of the diamond. Moisten about a 1/4" of the border of the dough on the lower half of the diamond with egg wash. Sprinkle generously with the sugar on the entire surface of the pastry. Fold the two sides of the dough into the center and then bring up the bottom half. Place on a baking sheet lined with parchment. Continue with all the remaining dough squares and chill for an hour or so. 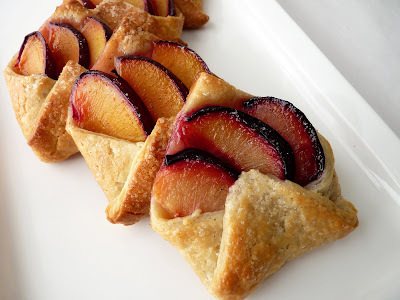 Place the pastries on two baking sheets lined with parchment or a silpat. Brush the pastry dough with the egg wash and sprinkle the whole surface with the remaining sugar. Bake in the top and lower racks, rotating half-way through, for about 20 minutes or until pastries are crisp and lightly browned. This is a riff on a cake by Mary Bergin I’ve long admired in Baking with Julia. It's a basic upside down cake but with an extra added pocket of streusel tucked into the cake batter. The cake looks so delectable in the photo and I’ve always wanted to get around to baking it. With some beautiful nectarines conspiring on my table, I decided to seize the moment. After pondering over the recipe, I wound up making a lighter version that uses considerably less sugar than the 2 3/4 cups called for in the original, fewer eggs, incorporates yogurt, a streusel without nuts and results in a 9” rather than a 10” cake. So although it turns out to be the same sort of idea and method, it became a completely different recipe. This is a cake that would be nice on a brunch table. 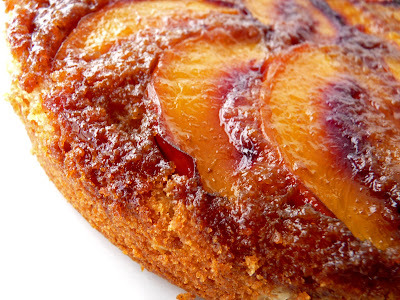 The great flavor of fresh fruit shines through as it bakes to a luscious sweetness in the butter and brown sugar topping. 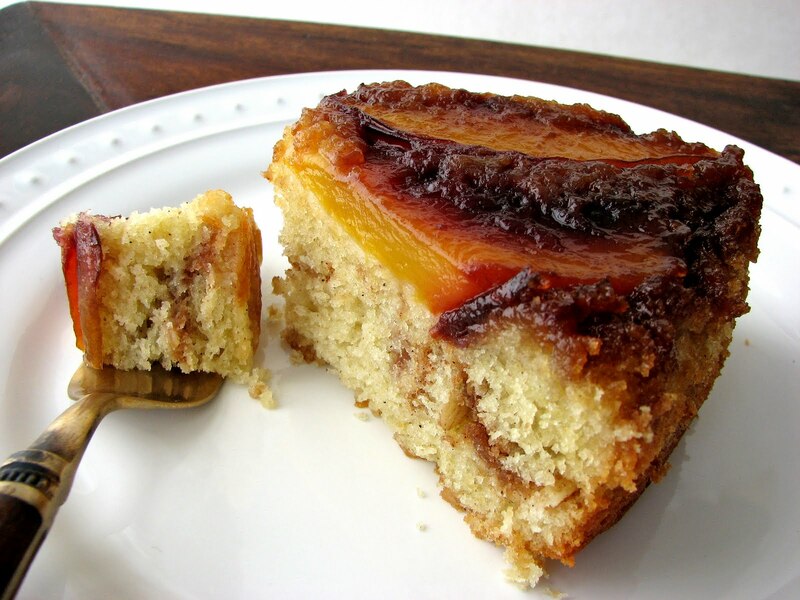 The streusel adds a chunky element to the cake as well as the welcome perfume of cinnamon. If you find yourself in need of a seasonal cake for a small crowd, this is a quick and easy fix. - I keep the butter and brown sugar for the topping to a minimum to showcase the goodness of the fruit. - This cake can also be made with fresh plums, peaches, figs, pears or apples. Change up the spices or add nuts to the streusel if you prefer. - If you don’t have yogurt, you can substitute milk or buttermilk. For the topping, pour the melted butter into a 9” springform pan, tilting to distribute evenly across the bottom surface. Sprinkle the brown sugar evenly over the melted butter and press to absorb. 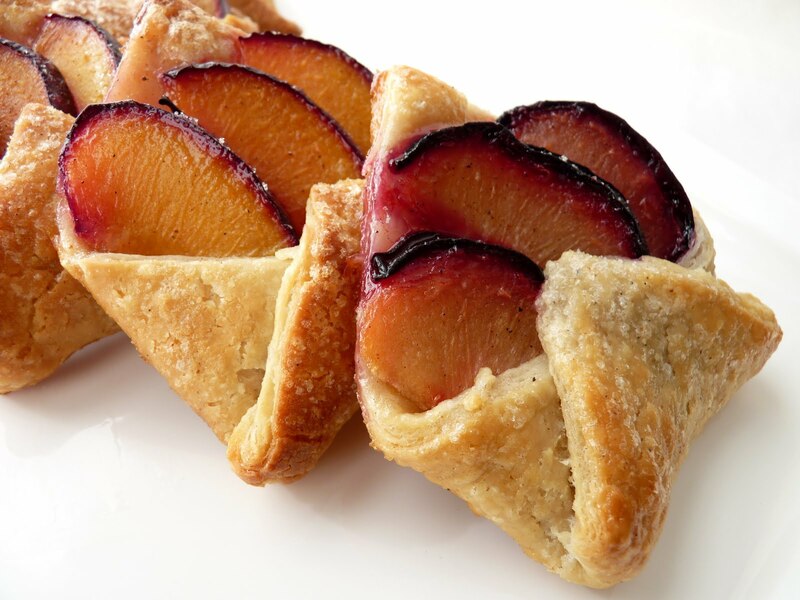 Cut the fruit into thin wedges, about 8 – 10 slices per nectarine. Arrange them on top of the butter and brown sugar topping and set aside. For the streusel, combine the flour, oats, brown sugar, cinnamon, salt and nutmeg. Add the cold butter and work it in with your fingers until the mixture is combined into large crumbles. The streusel should be chunky rather than fine so it adds a crunchy texture to the finished cake. Spread the mixture out on a baking sheet lined with parchment. Bake for about 8 to 10 minutes. Cool completely and set aside. To make the cake, sift together the flour, baking powder, salt and cinnamon. In a separate bowl, whisk together the eggs, oil, sugar, yogurt and vanilla until thoroughly combined. Gradually add the flour mixture and blend thoroughly. Pour about half the cake batter into the springform pan. Spread the batter to the edges using a small offset spatula. Sprinkle the streusel over the cake batter and then scrape the remaining cake batter on top of the streusel. Gently spread the batter to the edges of the pan. Place the springform pan on a baking sheet and bake for about 35 - 38 minutes or until a tester comes out clean. Cool the cake for 10 minutes. Run a thin bladed knife around the edges of the cake pan and remove the ring. Invert the cake onto a platter and gently remove the bottom of the springform pan. Cool and serve. Who hasn’t had their share of ripening bananas lingering about the kitchen, nagging for attention to their urgent condition? This is about one such recent occasion for me when I turned a couple of ever darkening bananas into ice cream. And just to keep it interesting, I decided to add a swirl of toasted pecan caramel. This ice cream is rich without being heavy. 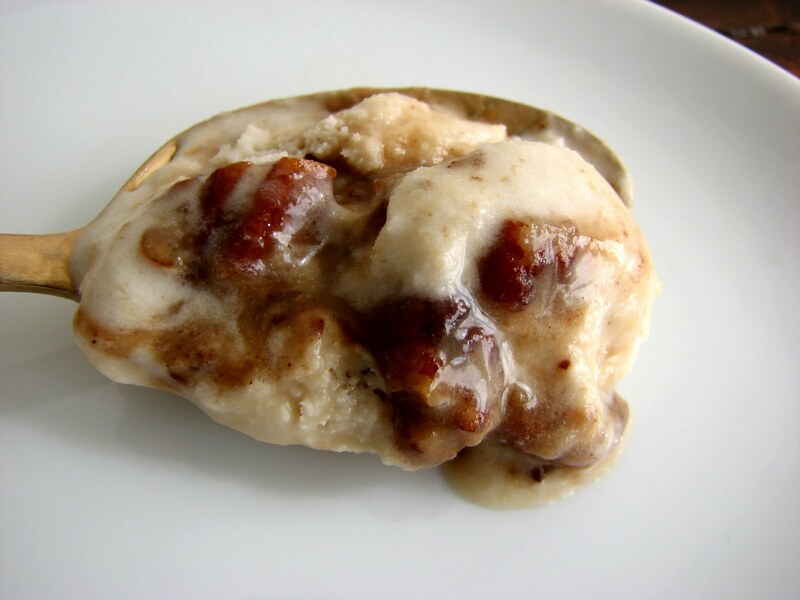 It’s got terrific banana flavor that is deliciously piqued with a good pinch of fresh nutmeg. Toasted pecans bathed in a beautifully complementary brown sugar cinnamon caramel add a punch of texture and spice in perfect harmony. A slightly salty edge to the caramel also brings an interesting interplay of sensation. 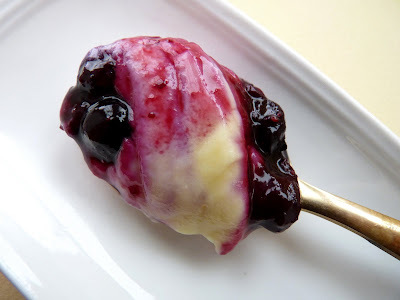 This is a very easy ice cream to make because it doesn’t require eggs or the cooking of custard. The ingredients for the ice cream get thrown into a blender or food processor to purée, which takes very little time. The pecan caramel likewise takes just about 5 minutes to produce. So consider this a pretty lazy way to enjoy some really delicious ice cream. The next time you see those bananas calling out to you from their peak position of flavor, consider this super treat. Waste not, want not! 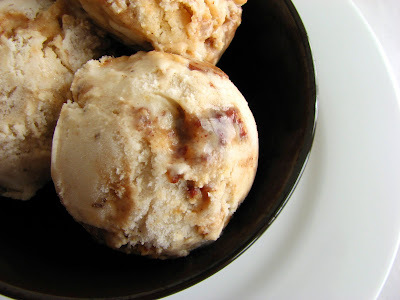 - The ice cream base and the pecan caramel can be made a day ahead and refrigerated. Bring the caramel to room temperature before layering with the ice cream so it’s easier to work with. - Nutmeg was a treasured and valuable spice in New England in the 18th and 19th centuries. These days, whole nutmeg is very inexpensive and can be found fairly easily. There is nothing like freshly grated nutmeg! You just need a little grater. - When making ice cream, always be sure your ice cream base is very chilled before putting into your machine to churn. This ensures a minimal and efficient processing time. - To help prevent ice crystals from forming on the surface, press a piece of plastic onto the surface of the finished ice cream before putting a lid on the container and placing in the freezer. - I like this ice cream all by itself, but it would probably cozy up to a simple piece of chocolate cake very nicely. Toast the pecans in a 350 degree oven for about 5 - 8 minutes or until fragrant. Cool and chop into bite-sized pieces. Place the milk, cream, sugar, lemon juice, bananas and nutmeg in a blender or food processor and blend until the bananas are puréed and the ingredients are smoothly blended. Add salt to taste. Pour into a container, cover and chill thoroughly. For the pecan caramel, heat the cream, brown sugar and cinnamon on medium low heat, stirring to dissolve. Bring to a boil for a minute or two. Take off the heat and add the vanilla and salt to taste. Mix in the chopped pecans. Pour into a container, cover and chill to firm up the caramel. Freeze the ice cream according to your machine’s directions. 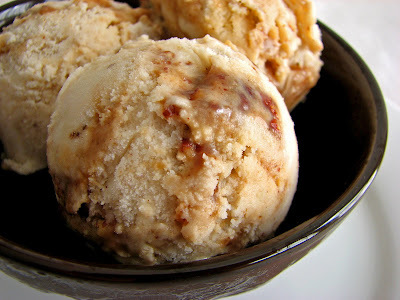 Pour about a third of the ice cream into a clean airtight container and then dollop a layer of half the pecan caramel. Repeat with a second layer of each and then finish with any remaining ice cream. Press a piece of plastic wrap into the surface of the ice cream, cover and place in your freezer to firm up a bit.